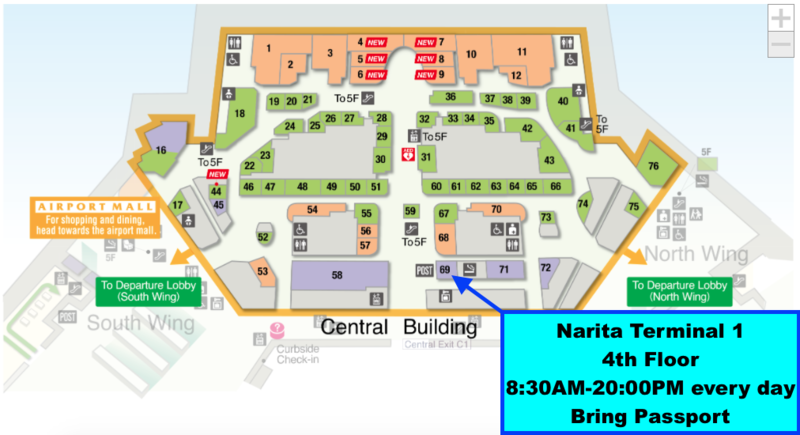 What is JapanWifiBuddy's service? What does it do? We rent out Pocket Wifi Devices. (Known in other places as Mifi or wireless routers.) They allow you to make your own little, mobile wifi network which connects to the internet via the cell networks. Stick it in your pocket and wirelessly connect all your cellphones, tablets and laptops to it, and stay connected to the internet wherever you go! Connecting is the same as connecting to any other wifi network at home or at work. We deliver it to your arrival airport or hotel, residence or AirBNB and we include a return envelope for you to send it back to us at the end of your rental. What is the process for airport pickup? Where do I pick the device up? How do I get it back to you? Can you ship to my AirBNB location or share house? Why don't you provide a backup battery with Expedited Shipping? Why am I being charged for Extended Hours Shipping even though I arrive within the Post Office’s hours at the airport? Are all the SIM cards unlimited data? What are the plans you have for SIM cards? Can I add more LTE data to my SIM card? Is my phone compatible with your SIM cards? Can we use the SIM card in other devices like a watch or another pocket wifi device or etc? Is tax and shipping included in the price? Can I buy the sim at the airport? Can I share my data with my friend with your SIM card? Is there a help center I can call in case I cannot install my SIM card correctly? Can I make phone calls to my family and friends back home? Is there any activation required for the SIM cards? What are the prices and plans? How do I get my money from JapanWifiBuddy? Where can I sign up to be an affiliate? What's the battery life on JWB's devices? What kinds of speeds can I expect? If I exceed my limit of data, what happens? What are the coverage areas on the WifiBuddies? Will I be able to use a Google Chromecast or other similar streaming device with a WifiBuddy? How far in advance do you recommend I rent my WifiBuddy router? What happens if I lose or damage the device? We include free 5-day shipping in all orders. This includes shipping to the airports listed below, as well as your hotel, AirBNB, local residence, or post office. We also include a return shipping envelope that is self-addressed and prepaid. We deliver to a number of major airports throughout the country, where pickup is simple and quick for you. 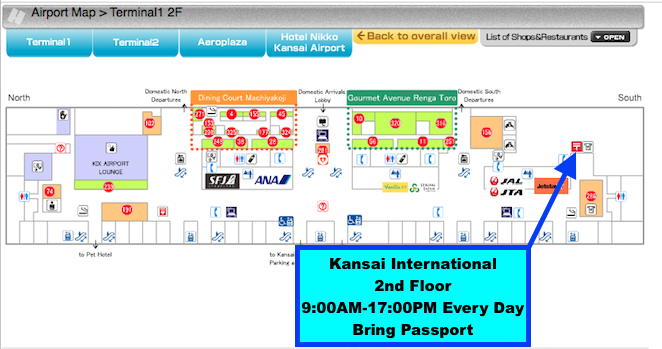 Once your order is completed, we’ll send over the necessary airport terminal map and other relevant pickup information. We ship the device to you wherever you are in Japan, including airports, hotels, AirBNBs or local addresses. 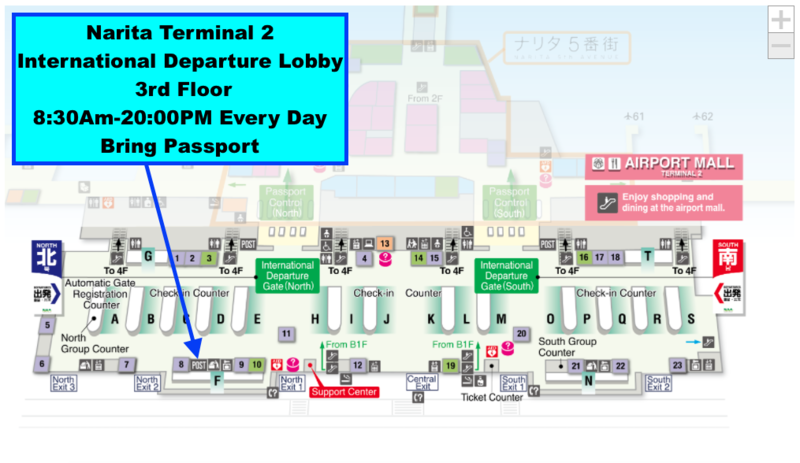 Once your order is completed, we’ll send over the necessary terminal map and any other information you’ll need. When it's time to send it back to us, just throw everything in the included return envelope and drop it off in a Japan Post mailbox! Yes! We do this regularly. Please make sure with your host/landlord that there will be someone on site to receive packages. Many locations do not have someone on-site and packages are often returned. Due to this, we ship to a nearby Shipping/Post office by default - which you can visit to pick up your package. In many cases, centrally located post offices operate 24 hours for added convenience. If you're absolutely certain that you or someone else on-site will be available to collect the package, please un-select the "There is no on-site host..." option in the Shipping section while placing your order or alternatively contact us after placing your order. Please note that we cannot be held responsible if you choose this option and miss your pickup. Beginning March, 2017, national laws in Japan have changed regarding shipping standard lithium-ion backup batteries using planes. Due to these tightening safety restrictions, we are no longer able to include a backup battery in our Expedited shipping orders. The WifiBuddy itself and it’s batteries are fine and will be fully functional. As this is originally a free bonus service, there will be no discounts given as a result of falling under this new rule. We’ve experimented with each airport with the general amounts of times it takes to get through baggage and customs, so we know generally how long it will take. To ensure that you can make it to the post office on time, we’ve built in a margin of safety so you can get through baggage and customs. If your arrival time is within that margin, the system will automatically set you up on Extended Hours shipping so that you will be able to get your package after arrival. In the event that the client needs to unexpectedly cancel their service before coming to Japan, as long as we have 6 calendar days notice before the rental starts, there will be no fee. If we've already shipped the package and the user cancels their order, there will be a 50% fee to cover our loss of use. If a rental cancellation is requested mid-rental, refunds will be determined on a case-by-case basis. We include chargers for both the backup battery and the router. They're all about the size of an iPhone 5. For Americans, that's 4.7" x 2.5" x .6". For everyone else, that's 12cm x 6.5cm x 1.5cm. None of our plans have any overage charges. If you exceed your limit, you're slowed down to 3G speeds, which can vary between .5-50 KB/s. We've experienced 3G during our testing that was pretty much the same speed as the LTE connection, but we've also experienced times when it was very, very slow. Please rent the right router for your data needs! Please inform us before shipping if you plan to do so, as we will need to change some settings and may need to communicate with Google to set it up correctly for you. Yes, all of our SIM cards provide UNLIMITED DATA, however each plan has a different amount of LTE-speed data. 8-day SIM you get 2GB of LTE-speed data, then once the limit is exceeded, the speed will switch to 3G for the remainder of your time. 15-day SIM you get 4GB of LTE-speed data, then once the limit is exceeded, the speed will switch to 3G for the remainder o your time. 30-day SIM you get 215MB (PER DAY) of LTE-speed data, then once the limit is exceeded for the day, the speed will switch to 3G for the rest of the day until midnight. The sim will automatically reset the LTE limit for the next day. 8-day SIM you get 2GB of LTE-speed data, then once the limit is exceeded, the speed will switch to 3G for the remainder of your time. 15-day SIM you get 4GB of LTE-speed data, then once the limit is exceeded, the speed will switch to 3G for the remainder of your time. 30-day SIM you get 4GB of LTE-speed data, then once the limit is exceeded, the speed will switch to 3G for the remainder of your time. For the HEAVY USER UNLIMTED DATA plans, (6-,12-,18-,24-,30-day plans) we don’t often see much throttling, but will occasionally see it if the user regularly exceeds 10GB of usage for a few days in a row. All our SIM cards are NANO-SIZE SIMs. However, we do have adapters (for additional $3.19USD) that we can provide if your phone/device requires a larger size. Can I extend my SIM card contract if I decide to stay longer? Unfortunately, we cannot extend the length of your SIM card contract after shipment. There isn’t a limit on the amount of SIM cards your purchase. As the data allowance and contract length are fixed on SIM cards, we’re unable to change the length afterwards. If you are unsure how much data you will be using, we recommend choosing opting for either the UNLIMITED LTE sims, or a Diamond WifiBuddy. Your phone will need to be unlocked for sim use, and it will be a good idea to confirm with your phone’s manufacturer. Generally a quick Google search can help you see if your phone will work with Japanese SIM cards. Our SIM cards run on the Docomo network. The SIM cards we provide are mainly used for phones. We don’t recommend attempting to use one in a pocket wifi devices that’s designed for another country. If you’re hoping to keep a group connected, we recommend renting one of our pocket WifiBuddy devices. Yes, tax is included in the price. Shipping will depend on your order. If you place an order 6 days or more in advance, you will generally qualify for the FREE standard shipping. 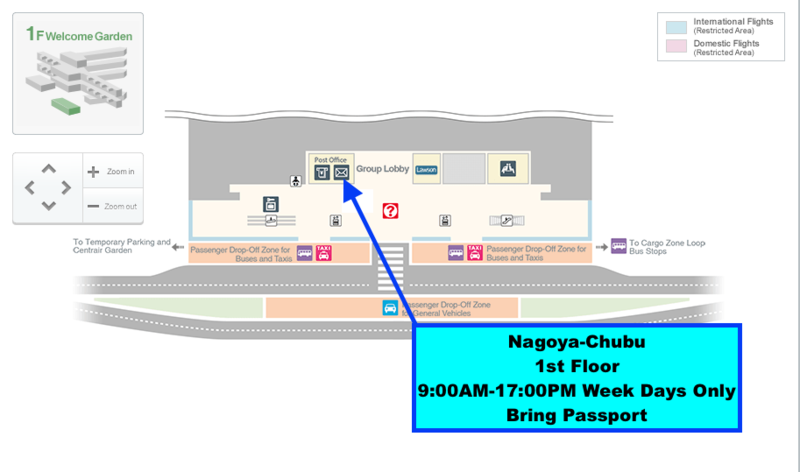 This service uses the Japan Post service. 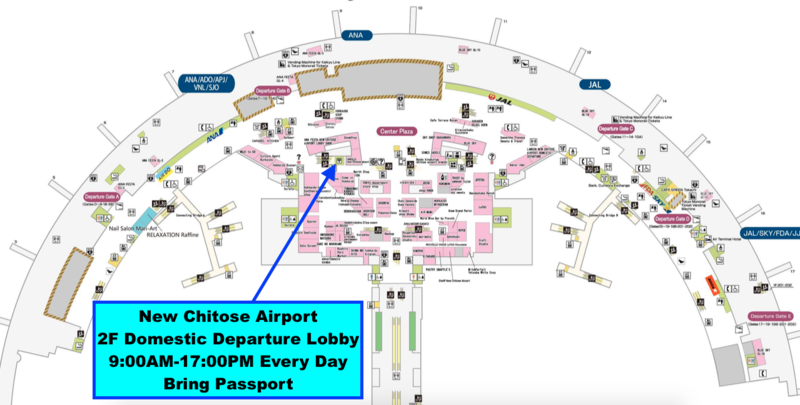 In the event that you would like airport pickup but your flight arrives outside of Japan Post office hours, we do offer an Extended Hours service through another shipping company, which costs an additional $12.99. Pickup directions and tracking information will be provided upon shipping as well. In the event that you need your shipment faster, we also offer Expedited Shipping. With this option however, we can’t ship to the airport and will only be able to ship to your hotel or a local shipping office. We can work with you to find the closest pickup location to your lodging. This option costs $14.29. If you order through our website we’ll have your package at the airport before you arrive, so you can pick it up upon arrival. However, to keep our prices lower than the competition, we don’t have an office at the airport for on-the-spot orders. Yes, the SIM cards we provide can use tethering, but please keep in mind that you have a limited amount of LTE data. (You have UNLIMITED DATA but each SIM card has a certain limit of LTE-speed data and once it is exceeded, the speed will switch to 3G). Please also be aware of background app refresh settings that may consume data unbeknownst to you. Generally we recommend getting a pocket WifiBuddy rental for groups, as this will provide superior data speeds and has it’s own dedicated battery for connecting multiple users and devices. No you will not need to return the SIM card. Once you are done using it, you can throw it away. Yes. In each of our packages, we provide an information pamphlet that you can use to set up your card. There’s a help number on there you can call for assistance. All the SIM cards we provide are DATA SIM ONLY, so you can make phone calls as long as you use an app like Facebook Messenger, LINE, WhatsApp, etc. No, the SIM cards activate when you insert them into your phone and install the settings correctly as per the included instructions. We're often sold out, so we recommend renting as far in advance as possible. In many cases we are sold out a couple of weeks in advance. To confirm availability for the model you would like, go to the product's page and click on the calendar. Grayed-out dates are unavailable. No one likes to talk about this kind of stuff, but it's good to get it out in the open just in case. If the device is lost or damaged such that it becomes unusable or unpresentable, we will bill your credit card for the replacement cost of the included device and accessories. See our Terms of Service for more information. We also offer insurance with all WifiBuddy rentals to halve any replacement or repair fees. Simply put, any time affiliates send clients to us who complete an order and then successfully return their WifiBuddy, the affiliate will receive cash. Affiliates will receive 5% of the sales price of the order. So if you send us a client and they make a $100 rental, you'll receive $5 of that. $200 rental, and you'll make $10. Travel blog writers who send dozens of clients can easily make hundreds of dollars through this kind of partnership! Once the rental is complete and the WifiBuddies have returned to our offices, we'll apply the cash to your account. We pay out via Paypal generally once a month so long as there is a significant balance to be paid.